A.R.T. is a state of the art system for the treatment of the underlying muscle and soft tissue problems that can cause pain, stiffness, weakness, or numbness. Any injury can cause scar tissue (or adhesions) to form. This scar tissue can trap nerves, or prevent muscles from working and moving properly. With A.R.T., your doctor can locate the scar tissue that has built up and break it down. This is accomplished by applying tension to the scar tissue while moving the muscle through a full range of motion. A.R.T. treatment is safe and is so effective that many world-class athletes demand A.R.T. treatment as part of their training and rehab. What are adhesions (and why should they concern you)? Adhesions are a microscopic form of scar tissue. Scar tissue is the material that the body manufactures to repair itself. If improper healing has occurred and over use or improper healing has occurred and over use continue, adhesions will continue to form indefinitely. Adhesion formation is much like the buildup of “gristle” in a cheap cut of meat. Adhesions can cause problems because they act like glue to “gum up” muscle tissue. This can result in weakness, pain, and reduced flexibility. In addition, if scar tissue develops around a nerve, it may cause symptoms of tingling or numbness. If left too long, this may lead to permanent nerve damage. Why won’t the pain go away by itself? After injury, the normal healing process leads to inflammation and some scarring, which patches up the damaged tissues. However, if an injury is not properly addressed inflammation and scar tissue can become more severe, leading to the beginning of the chronic injury cycle. The major factor that allows this chronic injury cycle to continue is the scar tissue (adhesions) that build up in soft tissue (muscles, tendons, ligaments, and nerves). When scar tissue changes the way that the muscles function, this leads to further irritation and inflammation, which in turn leads to a continuation of the cycle and more pain. 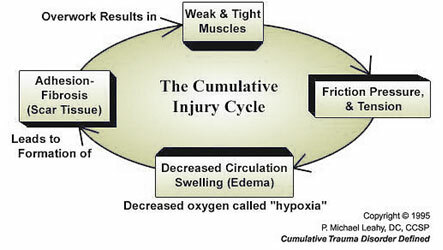 As long as scar tissue is present, the chronic injury cycle will continue. A.R.T. helps to stop this cycle by breaking down the offending scar tissue restrictions and restoring normal tissue motion and function. What types of conditions can A.R.T. help? Can A.R.T. help patients who have had chronic pain for years? Often, yes. The majority of patients respond well to treatment, even if they have had symptoms for years. Of course, each case is unique and will require a full assessment. This treatment is one of the most effective procedures for muscle and tendon injuries. In fact, in a recent study in the Journal of Occupations Rehabilitation, A.R.T. had a success rate that was higher than conventional treatments for tendon-type injuries. Dr. Stephen Jones is a fully certified ART provider.